The average American eats 61 pounds of refined sugar each year, including 25 pounds of candy. Halloween accounts for at least two pounds of that. Sugar may give you wrinkles via a process called glycation, in which excess blood sugar binds to collagen in the skin, making it less elastic. Cutting back on sugar may help your skin retain its flexibility. People in India have been crystallizing cane sugar for at least 2,000 years. When Alexander the Great’s companions arrived there, they marveled at the production of honey without bees. More than half the 8.4 million metric tons of sugar produced annually in the United States comes from beets. Soft drinks with artificial sweeteners may actually help make you fat. In a Purdue University study, rats drinking liquids with artificial sweeteners consumed more calories overall than rats whose drinks were sweetened with sugar. A diet high in sugar can lead to weight gain, diabetes, nutrient deficiencies, cavities, and dental plaque. The artificial sweeteners saccharin and aspartame were found accidentally when lab workers doing research that had nothing to do with sweetening put a bit of the test compounds in their mouths and liked what they tasted. A compound called lugduname is the sweetest compound known—more than 200,000 times as sweet as table sugar. Sugars are molecules of carbon, hydrogen, and oxygen. The simplest include glucose, fructose, and galactose. Table sugar is crystallized sucrose, a fusion of one fructose and one glucose molecule. 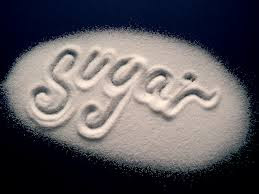 Sugars are the building blocks of carbohydrates, the most abundant type of organic molecules in living things. Glycolaldehyde, an eight-atom sugar, has even been found in an interstellar gas cloud near the center of the Milky Way. Glycolaldehyde can react with a three-carbon sugar to form ribose, the basis for both RNA and DNA, so the glycol­aldehyde found in deep space may be a chemical precursor to life on Earth. That cloud also contains ethylene glycol, a sweet relative of glycol­aldehyde and the main ingredient in antifreeze. n 327 BC, Alexander the Great discovered the sugar cane; it then spread through Persia and introduced it in the Mediterranean. Christopher Columbus introduced sugar to the New World in 1493 on his second voyage. Sugar was called “White Gold”: Until the late 1700's, sugar was a luxury that European nobility used to validate their rank and social power. Sugar does help the medicine go down! It’s an important component of many modern medicines. Some people say that one teaspoon of sugar swallowed “dry” can cure the hiccups! Some plants can make their own sugar— when a banana ripens, it changes starch into sugar, making it sweeter. Sugar helps bread or doughnuts rise when they’re baked. Sugar cane stalks can reach 30 feet high! Sugar prolongs the life of fresh cut flowers. Sugar is an important source of carbohydrate—the body’s main energy supply. Sugar can help get you there to find out. Burn sucrose with a dose of corn syrup and saltpeter and you get “sugar propellant,” a popular amateur rocket fuel. It’s not all mind games. The sugar glucosamine works as an immunosuppressant in mice, and xylitol (a sugar alcohol) can prevent ear infections in kids.